Refer to DTC P0300 (See page ). Refer to DTC P2195 (See page ). The difference in air fuel ratios between the cylinders exceeds the threshold (2 trip detection logic). The ECM uses the air fuel ratio sensor and crankshaft position sensor to monitor the difference in air fuel ratios between the cylinders caused by differences in injection volume between the cylinders, leakage in the intake or exhaust system, etc. When the air fuel ratios of the cylinders are lean or rich with respect to each other, the ECM determines that a problem is present and stores a DTC. Air Fuel Ratio Sensor Monitoring Method: P219A is stored primarily when a rich side imbalance is detected. When the system detects a difference in the air fuel ratios between the cylinders due to fluctuation in the air fuel ratio sensor output over 1 engine cycle (2 crankshaft revolutions), the system determines that there is a problem. Crankshaft Position Sensor Monitoring Method: P219C, P219D, P219E and/or P219F are stored primarily when a lean side imbalance is detected. The system monitors the engine speed variation and when the variation becomes large, the system determines that there is a difference in the air fuel ratios between the cylinders, which it determines to be a problem. Start the engine and warm it up until the engine coolant temperature reaches 75°C (167°F) or higher [A]. The A/C switch and all accessory switches should be off and the shift lever should be in P or N.
Drive the vehicle at 60 km/h (37 mph) or higher for 2 minutes or more [B]. It is acceptable to turn electrical loads on while driving. Idle the engine for 2 minutes or more [C]. Enter the following menus: Powertrain / Engine / Trouble Codes [D]. Drive the vehicle at less than 30 km/h (19 mph) for 5 seconds or more [E]. Accelerate the vehicle from 30 to 60 km/h (19 to 37 mph) over a period of approximately 10 to 20 seconds. Refer to the values of mass air flow and engine speed in Typical Enabling Conditions before accelerating the vehicle from 30 to 60 km/h (19 to 37 mph). Drive the vehicle at 60 km/h (37 mph) or more for 5 seconds or more [F]. Drive the vehicle at less than 30 km/h (19 mph) for 5 seconds or more [G]. Drive the vehicle at 60 km/h (37 mph) or more for 5 seconds or more [H]. Repeat steps [G] and [H] above at least 2 times [I]. Idle the engine for 1 minute or more [J]. Input the DTC: P219A, P219C, P219D, P219E or P219F. If the judgment result shows INCOMPLETE or N/A, perform the following procedure. Refer to Fuel Injector Circuit (See page ). Read freeze frame data using the Techstream. Freeze frame data records the engine condition when malfunctions are detected. When troubleshooting, freeze frame data can help determine if the vehicle was moving or stationary, if the engine was warmed up or not, if the air-fuel ratio was lean or rich, and other data from the time the malfunction occurred. When any air-fuel ratio imbalance is detected, the ECM will perform air-fuel ratio feedback control to make the air-fuel ratio close to the stoichiometric level. This may result in an air-fuel ratio imbalance of normal cylinders and DTCs may be stored. If any DTCs other than P219A, P219C, P219D, P219E and/or P219F are output, troubleshoot those DTCs first. (c) Using the Techstream, confirm the vehicle conditions recorded in the freeze frame data which were present when the DTC was stored (See page ). When the sum of Short FT and Long FT is positive, the engine is running lean, and when the sum is negative, the engine is running rich. Malfunctioning of cylinders detected by Crankshaft Position Sensor Monitoring Method is primarily suspected. *: When any air-fuel ratio imbalance is detected, the ECM will perform air-fuel ratio feedback control to make the air-fuel ratio close to the stoichiometric level. This may result in an air-fuel ratio imbalance of normal cylinders and DTCs may be stored. (d) Drive the vehicle in accordance with the driving pattern described in Confirmation Driving Pattern. If any misfire count ("Cylinder #1 Misfire Count" to "Cylinder #4 Misfire Count) increases while idling or driving the vehicle, proceed to step 6. Perform inspections while focusing on the cylinder whose misfire count has increased. (e) Enter the following menus: Powertrain / Engine / Trouble Codes. (d) Warm up the engine. (e) Enter the following menus: Powertrain / Engine / Active Test / Control the Injection Volume / Data List / Cylinder #1 to #4 Misfire Count. 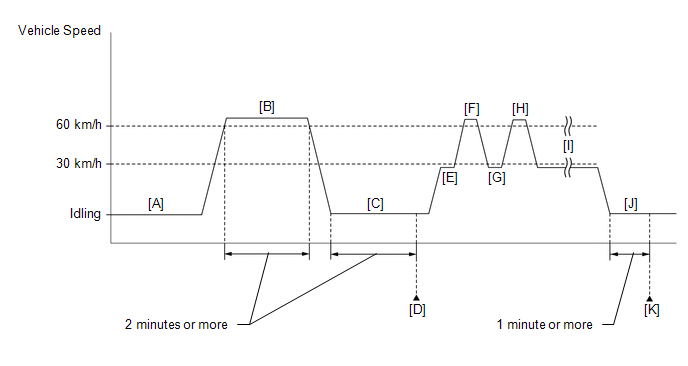 When the "Control the Injection Volume" Active Test is selected (injection volume is 0%), if a misfire count increases, proceed to step 6 (Check Intake System). (f) Perform the Control the Injection Volume operation with the engine idling. (g) Check the misfire counts ("Cylinder #1 Misfire Count" to "Cylinder #4 Misfire Count") while decreasing the injection volume in 5% increments. Do not decrease the injection volume by more than 20%. The cylinder whose misfire count has not increased can be assumed to be running rich. Therefore, perform inspections while focusing on that cylinder. (a) Check the intake system for vacuum leaks (See page ). No leaks in intake system. (a) Inspect the spark plug of the cylinder causing the imbalance (See page ). Perform "Inspection After Repair" after replacing the spark plug (See page ). (a) Perform a spark test (See page ). If the result of the spark test is normal, proceed to the next step. Perform "Inspection After Repair" after repairing or replacing the ignition system (See page ). (a) Measure the cylinder compression pressure of the misfiring cylinder (See page ). Perform "Inspection After Repair" after repairing or replacing the engine assembly (See page ). Perform "Inspection After Repair" after replacing the fuel injector assembly (See page ). (a) If the case of the problem has not been found even after performing the troubleshooting procedure, perform the inspection below. (b) Check the intake valve for deposits. As the DTC may have been stored due to deposits on the intake valve, remove the cylinder head and check the intake valve remove the cylinder head and check the intake valve. (h) Drive the vehicle in accordance with the driving pattern described in Confirmation Driving Pattern. (i) Enter the following menus: Powertrain / Engine / Trouble Codes.